Situated on the one-way ring road going round the Santiago del Teide area of Los Gigantes is an old, traditional Canarian building, with its characteristic wooden balconies. Part of this edifice is occupied by Bar Bamboo, one of the oldest in the area. In the other half, you'll find a similarly long-established business, Mirandas Restaurant. Family run since day one, it is regarded by many as one of the best in Los Gigantes. Manager Fernando Jimenez Plasencia has given the interior of his restaurant a fine, sophisticated ambience, with mood lighting, subdued decor and - of course - the dark wood balconies. He employs chef Donald McEwen, whose dishes are described as "international" and "creative". On offer are steaks and chicken, served up still sizzling on an iron skillet. For this reason, the restaurant offers bibs to the customers to avoid the juices splashing on their clothes. These meats come with a large choice of sauces - the "safe" ones, such as pepper or mushroom, but, for those of you who fancy something with more of a kick, try the spicy Cajun or Jamaican chicken. There are also, naturally, numerous fish dishes on the extensive menu, too and all meals come with a choice of chips, rice, Canarian or gratin potatoes. Vegetarians are well catered for also. Other notable offerings are roast duck with black cherry sauce and leg of lamb. This is a very popular restaurant, with people returning time and time again, usually being greeted like old friends. As a result, it's quite often full, so, if you make an impromptu visit, you may have a long wait for a table. Also, you need to be aware that, as all dishes are cooked to order, from scratch, you may have quite a long wait between ordering your meal and actually getting it. To reflect the quality of the food, prices may be a little higher than other restaurants in the vicinity. 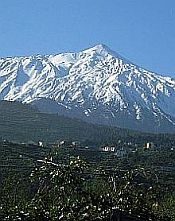 As I said, the venue is found on the one-way ring road around Santiago del Teide. Going in the direction of the traffic, watch out for the large hotel Stil Los Gigantes on the right, then, a bit further on, you'll come to the restaurant, on the left.